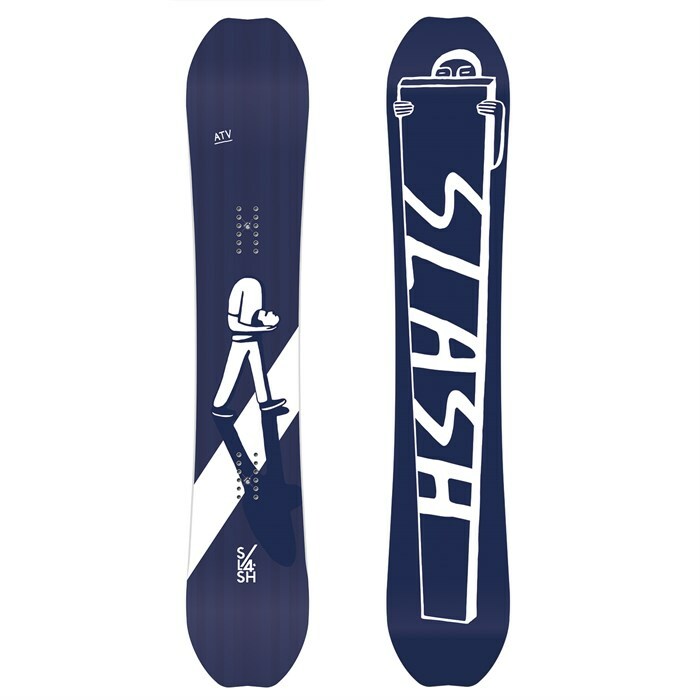 The original Slash is an all-terrain machine with tons of soul. With traditional camber and a blunted directional twin shape, the Slash ATV Snowboard really does everything well. Very well. It's a lightweight swooper with tons of pop, perfect for ripping from feature to feature and having fun along the way. With a hair of setback, it's got the float for deeper days, but it's far from a wiggly powder board that can't rail a carve: this thing finishes out turns with a spring in its step, propelling you into the next arc. If you're out there pretending to be Gigi, and who isn't, this is an all-mountain machine that can get you there. Camber  A tried and true camber profile that offers a precise feel, predictable turns, solid edge hold, suspension and powerful pop. Traditional camber distributes weight evenly and offers a progressive flex pattern. Reactive Flex  A unique two-strand fiberglass blend that, in combination with wood cores, promotes flex across the width of the board as well as tip-to-tail. This gives the board a more reactive ride overall. When board sliding a rail it helps you lift the edge slightly so you don’t hang up. When railing a turn, it helps bite down further with more power. Progressive Sidecut  A progressive sidecut design blends many radii and smooth contact points for buttery smooth turn initiation, edge-to-edge transition and edge hold. It’s different for each model and matches the sidecut to the board’s specific camber profile. Forever Woodcore  Constructed from four different lightweight wood species—paulownia, spruce, beech and poplar—for a premium core that offers a highly tuned and dynamic feel. It’s flyweight, durable, filled with pop and highly reactive. Buried Treasure  A truss of carbon, kevlar and basalt fibers. Stronger connecting fibers allow for a slimmer core and reduced weight. Strategic placement this gives liveliness to the board by increasing responsiveness to the tips and leaving torsional softness between the feet. Sintered HD Base  this fast and hard sintered base provides the most impact resistant surface available and its high-density molecular structure holds wax longer for sustained speeds. Diamond Stone Base  Slash adds a slight diamond-structured stone grind to the base to maximize glide and optimize durability. It eliminates the slow, suction cup feel that comes with one- dimensional base finishes. Ultimate Traction  This small counter radius (bump) placed in the middle of the board’s sidecut improves edge hold without creating drag or strange edge grip. It adds extra bite on ice and turns regular turns into confident carves. Factory Waxed  All Slash boards are factory waxed with One-Ball Jay wax and ready to shred straight out of the wrapper. All-Mountain All-mountain snowboards are designed for exploring the whole mountain. They are your go-to for a snowboard that will do anything. They feel at home on groomers, powder, park runs and almost anything in between. The vast majority of snowboarders choose all-mountain boards for their great versatility. If you’re just getting started or unsure of exactly what you need, an all-mountain snowboard is a great choice. Freeride Freeride snowboards are designed for the rider that spends most of the day off groomed runs and in backcountry terrain. They typically have a stiffer flex and are ridden in longer sizes than freestyle snowboards. Freeride snowboards often feature a directional shape that is designed to perform optimally in one direction.